Knowing we had a long day of cycling ahead of us we rose early and checked out of hotel before breakfast was even served. The sun was still low in the sky and the surf was glistening with soft sunrise hues. 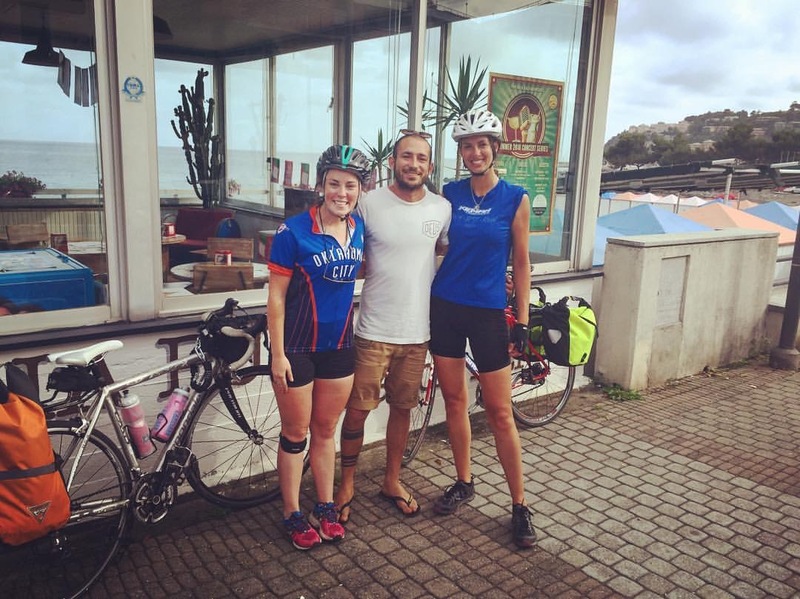 I am calling this post “Italian Men” because as soon as I began planning to cycle this region people warned me I would be incessantly verbally harassed by Italian men. 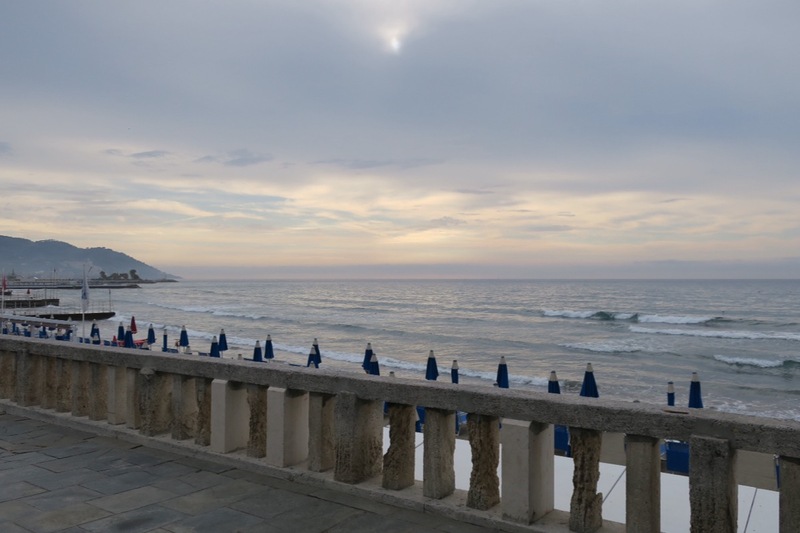 Having experienced verbal harassment in several other countries, I braced myself for the reality that our month in Italy could be additionally tedious for this reason. 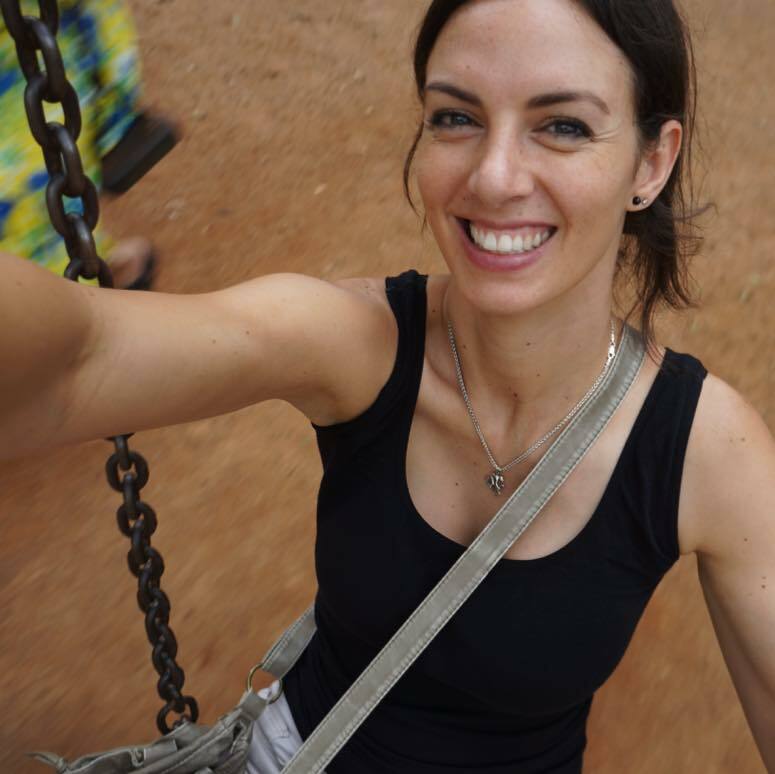 Bita and I talked about strategies for dealing with it, but today was our first full day in the country to gauge if Italian men would help or hinder our trip. 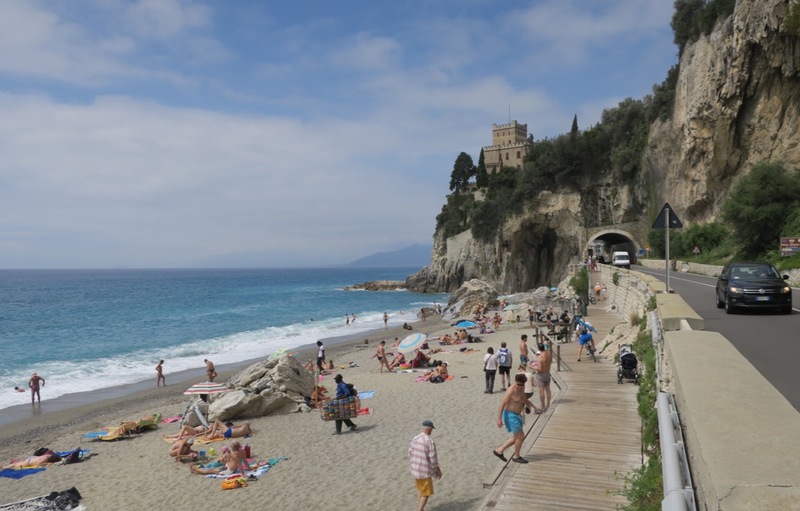 We cruised along the coastline for the first part of the day, enjoying the ups, downs, and incline saving tunnels that have been very prevalent in Italy so far. Needing a pee break we began scoping out a stop. When nature calls we have a few options: cafes, gas stations, grocery stores, the occasional public toilet, and strategic greenery. We spotted a gas station and zoomed in. When we use a gas station bathroom we usually try to buy a gatorade or something as a thanks for letting us use the facilities. This gas station had two cases of fruit sitting next to it, so I figured we’d buy a few pieces. The female attendant inside didn’t speak English, so I played a hasty game of charades and said something that sounded like “fruit-ah” and she was onto me. She grabbed a sack and begin filling it with peaches and apricots despite us indicating we wanted 2 or 3 of each. 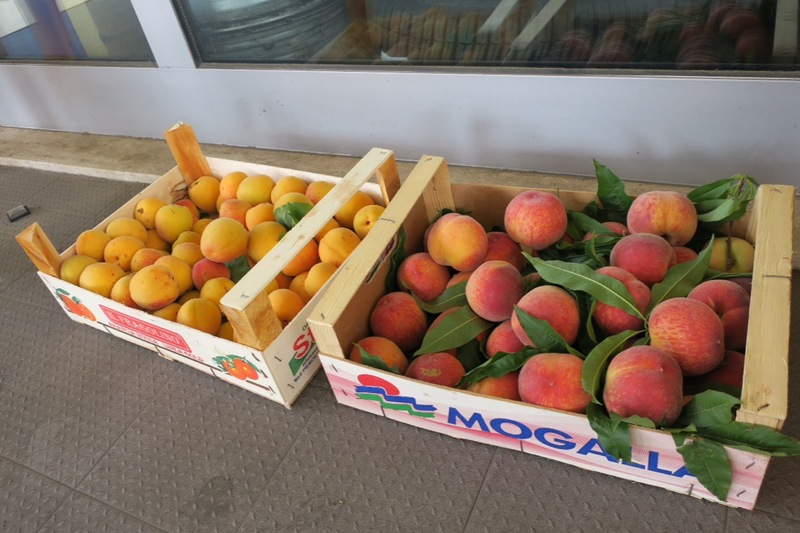 Then she handed us the bag of fruit (and wouldn’t take any money for them) as matter-of-factly as if we were family who had wandered in asking for it. I think the apricots came from her own tree. We were so thankful! After using the facilities we started chatting with the son of the woman who gave us the fruit. He was astounded when we told him about our trip and was very excited that we were headed to Greece. “It is so beautiful!” He said, and ran inside to grab pictures of him and his girlfriend on their trip to Greece, giving us advice of what to see as he did. He wished us well on our trip and we cycled off. Our next stop was for an oceanside “brunch” of the fruit we had been given and pizza leftovers from dinner the night before. Not wanting to leave any of the scrumptious pizza behind I strapped the to-go box to my rear rack with a bungee cord. 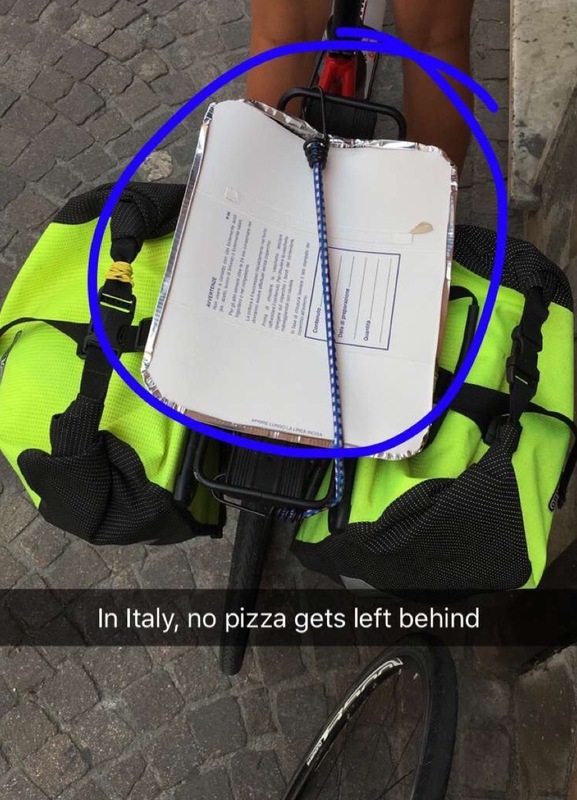 In Italy, no pizza gets left behind. We continued along the coast when I stopped to snap this next picture. A handsome young African Italian was walking by on the boardwalk and we made eye contact as I lowered my camera. “Ciao!” I said emphatically, excited to be using my few words of Italian when I could. In response he rattled off a few sentences in Italian. “Uh, Ingl-ee-see?” I stammered, not exactly sure how to say English in Italian. He paused for a second. “You’re cute”, he said, before sauntering off in the direction he was going. When I told Bita what he said we laughed and laughed. This Italian sexual harassment is too much! Who needs a sand castle when you can have the real thing! When lunch time rolled around we did what we do best, scouted for an appealing eatery. Bita saw it first and shouted “sushi!” We are both sushi addicts, so we thought we’d try the Italian take on it. Walking into the restaurant (which was packed) we were informed they were offering an all you can eat sushi lunch special for 11 euros. Sign us up! 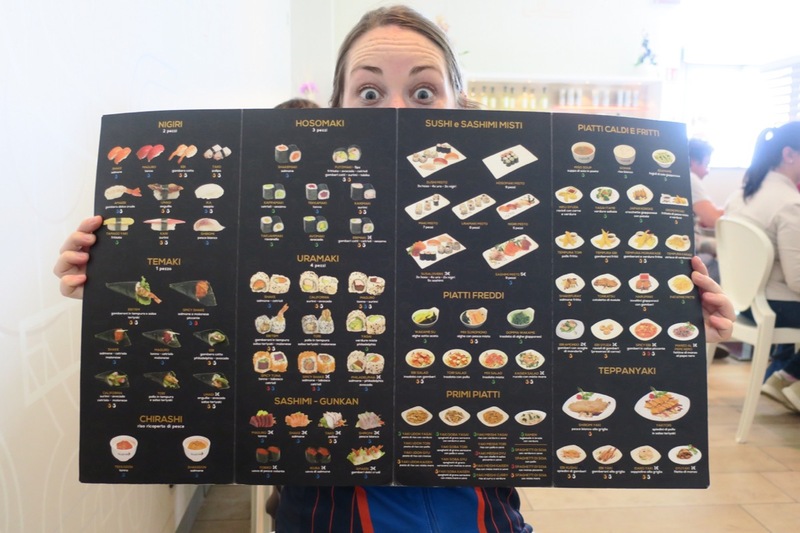 All you can eat sushi? Challenge accepted! We left an hour and a half later after ordering so many rounds of sushi we started feeling bad for our servers and had developed massive food babies. We waddles to our bikes and pulled off at the first inviting park. 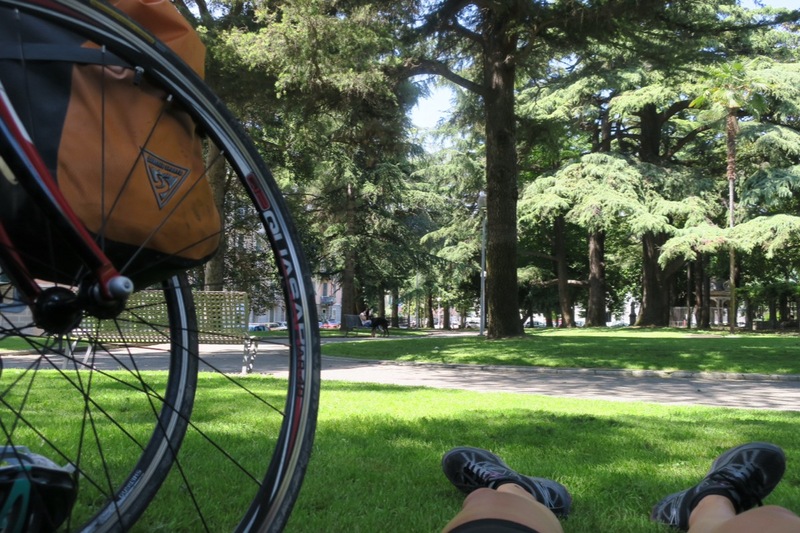 This occasion called for a siesta, cycling style. After our post lunch nap we continued onward. We soon pealed off the coast and began climbing. At one point we pulled over to check our map (we do this a lot) on the side of a busy highway. A car pulled off to the side in front of us as we were hopping back on our bikes. A man got out “do you need any help with directions?” He offered, but we were already on track and starting to rejoin traffic. “We’re good, thanks though!” He had obviously stopped just to help us with our map. Too kind of you Mr. Italian man. We rejoined the coastline and it was a straight shot to Genoa. We cycled onward, excited by the thought of an earlier than expected arrival when we arrived at our second closed tunnel of the trip. And this one was REALLY closed–due to a landslide–no cutting through mesh this time. We pulled off the road to review our map. There was no clear secondary road and the convoluted network of roads North of us were dizzying. Just then a nice Italian man walked up. “Do you need help with directions?” He proceeded to give us detailed (and perfectly accurate!) directions on residential and unmarked roads to get us past the blockage and back on our route. As it turned out, he also worked the Pria Pulla bar we had parked next to, and served us up a couple espressos on the house. After posing for a picture (shared on the bar’s facebook page) we were back on the road. We followed our guy’s perfectly articulated directions and were back on track 25 minutes later when we ran into Micky, our 3rd touring cyclist of the trip. Micky is from Hungary and was headed the opposite direction towards Spain. We shared with him our path to circumvent the landslide, as well as road stories and a few laughs. He gave us his map of Slovenia (we’ll be there after Italy) and we parted ways. It had been a great day full of kind people. None kinder, perhaps, than the Italian men which make Italy the incredible country it is. Awesome to read that the haters stayed nil while the Good guys ruled the Italian countryside today. Great stories and what a lunch find fit mega cheap sushi!! Well done, ladies… Ride on!! We’re most of the way through Italy and the men have continued to be kind souls. We love Italy! !